We all love to talk about our kids. How great they are in swimming, how well they do at math, what good listeners they are! But you rarely hear a parent bragging about how WILD their child is. Why is that? When WILD is such a great thing to be? 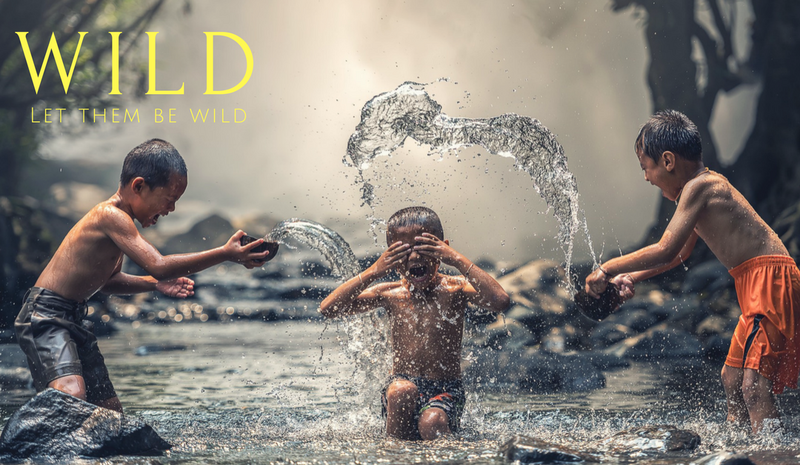 Wild kids are HAPPY, they are INDEPENDENT, they are problem solvers and they love to be outside! This is the kind of wild I’m talking about when I say our kids need to be more wild. Something planted firmly in the way of our children and their fabulousness wildness is their schedules. Pottery classes, fencing classes, HOCKEY! There are such wonderful opportunities available now that it becomes easy to overdo the extracurricular activities. We start off trying this one out, and then that one, and before we know it we’re eating dinner in the car and doing homework at 9 pm because there just wasn’t time until then! I’m not saying that your children should never be in any activities outside of school! I’m saying that before you commit to hours a week for months at a time, weigh the pros and cons. Consider the benefits of child-driven activities vs. adult-driven ones. Do you want your child being told what to do, and expected to conform to rules and expectations? Or would you prefer your child to learn problem-solving skills, and enjoy exploring the world on their own terms? Likely the best answer is a combination of the two types of activities. Keep in mind when the sign ups start about what kind of child you have and where they thrive, what skills you’d like to see developed, and what is important to your family as a whole. When gramma is next asking about how her darlings are, make sure to be able to tell her they’re a little bit WILD – and that they are sleeping well, eating well and HAPPY, because of it.